Mother's Day in the Schwartz house is pretty much cursed. I know a lot of people who have a great and cute tradition of taking a picture with their kids on mother's day. Man, I wish we had that. But every year it just doesn't seem to work out for us. My first mother's day Chris spent at the house doing flood repair. My second mother's day was the day referred to as the "Mother's Day Massacre" when Chris cut Sarah's hair. And this mother's day Cody was passed out and Sarah was in full on tantrum mode so a picture after church while we were still all cute was just not an option. But it was a great mother's day. Chris picked out some adorable cards that perfectly fit the kids. He traced Cody's hand on the one from him. Then he helped Sarah sign her name on her card and let her draw me a heart. Chris surprised me with a spa package. He's done this before, and he always gets annoyed with me because it takes me MONTHS to schedule it. (And by moths it may have taken me 11 months last time he gave this to me for me to go.) In my mind, once I go it's gone and I'll have nothing to look forward to. But it's a very nice treat and I'm looking forward to the massage, facial, lunch, manicure, and pedicure and not to mention being away from the kids! In nursery the kids made me some art. This was a huge break through for Sarah. 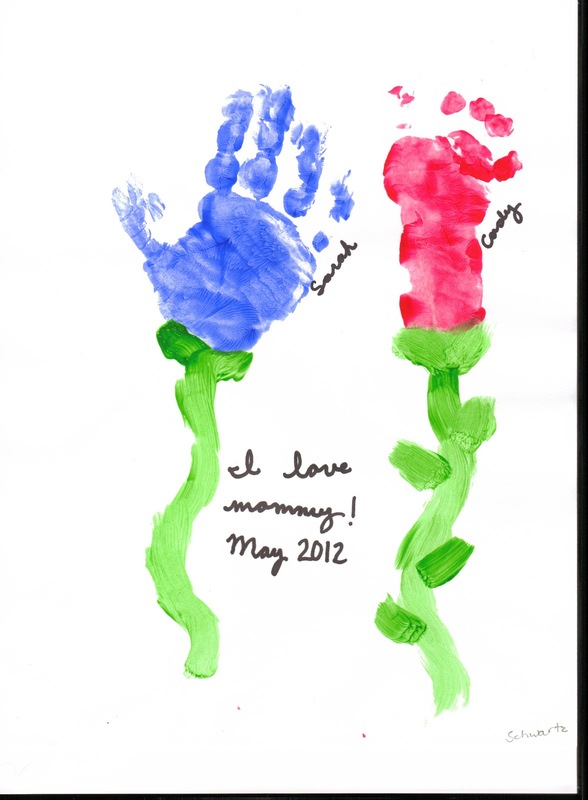 Last time they did handprint art she cried and wouldn't let them put paint on her because it would make her messy. Sis. O'Brien had to go get Chris to come and tell Sarah it was ok in order to do it. This time they were very proud of her because she was excited to do it. She lined up with the other kids and kept asking when it was her turn. Today when she brought me the picture she just beamed with pride as she told me about it. "They made my hand blue and then the put it right there. See! Right there. It's a flower. It's a blue flower. It's blue, and red, and green! See Mommy!" I think that right there is about the best present ever. That and hearing Sarah tell me over and over today, "Happy Mother's Day Mommy!"